Some years ago Pete and I both thought that we were allergic to crustacean. We both have the allergy for fish so that's why we thought it was the crustacean as well. Then Pete read this article that said that it is really rare to have an allergy for fish and crustacean both. As culinarists we were really excited and went to the market hall and bought different kind of oysters and mussels. It was amazing. After that I have been eating a lot of crustacean especially shrimp. We decided to spend last weekend together at the cottage because the hunting season is starting and Pete and our hunting dog Mimi will be away most of the time during the autumn. 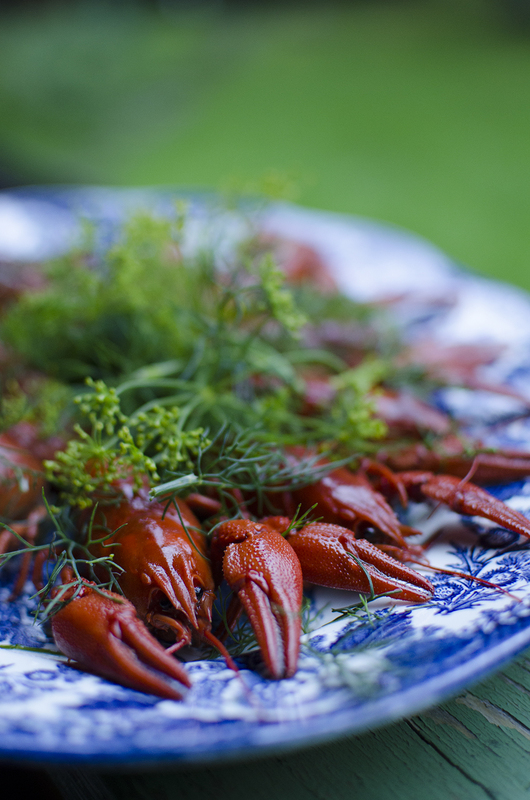 As it is the season for traditional Finnish ans Swedish crayfish parties we wanted to eat crayfish at the cottage. Pete went to the market hall and bought ready boiled crayfish and few oysters for starters. For wine we had a bottle of Jacquart champagne. Pete bought the crayfish from Eriksson at the market hall. Poor Instagram pic of the table setting as I forgot my flash at home. It was so good. I wish to eat more crayfish soon! Do you prefer noble crayfish ("jokirapu") or signal crayfish ("täplärapu")? The ones we had were noble crayfish. I have not really been exercising lately. My friend Maria told me earlier this summer about Helsinki Core Trainers where she trains in the Bootcamp group. So today I finally joined her for the first time. The work out was HARD but really effective. I will go again later this week! Earlier last year when I was training with a personal trainer I learned that after the work out you are supposed to eat quickly (like within 30 minutes). So when I came home I started to cook something simple and fast. I was too hungry to get my DSLR Camera, so this is a Instagram picture. This is what I ended up eating. For protein I had some shrimp and cottage cheese. For veggies I choose salad, cucumber and marinated tomatoes and spring onions mixed with the shrimp. I also boiled some buckwheat on the side. Mix all together with the ingredients you want to marinate. Enjoy your meal! You can easily vary this recipe and choose different kind of vinegars. This time I used apple vinegar spiced with raspberry and peach. Luckily I had my bicycle to get home. I would have been too tired to walk after the workout. Do you need help with workout food ideas? Would you like me to post more of this kind of food tips?